All things come to an end and after so much blood, psychos, and double crosses, the efforts of Rhys and Fiona to find fortune and glory have culminated in the discovery of the Vault of the Traveler. What once began as an attempt to screw over a Hyperion’s executive turned into an adventure filled with all the right story beats: soul searching, love, loss, conniving deals, explosions, and backstabs. Tales from the Borderlands ends its season with “Vault of the Traveler,” and like every other episodic series, all the decision making and narrative loose ends leading up to this moment come to a head as our heroes team up for their biggest challenge. After securing Gortys’ final add-on, a beacon that would materialize the entrance of the Vault, Rhys came under attack from the Handsome Jack AI after freeing itself from its dimwitted host and into Helios, taking full control of the lunar station. The team escapes, but not without taking a few knocks and bruises. On Pandora, Gortys undergoes a dramatic change once the beacon has been installed and the Vault itself opens, revealing the presence of a behemoth. As Gortys struggles with the colossus, Fiona is forced to make a difficult decision that will save her friends but doom another. Meanwhile, Rhys has a moment with Handsome Jack that will help define him into the person he has become in the present day cutaways featured prominently in previous episodes. In the end, masks are unveiled and friends are reunited in a surprisingly touching and mostly satisfying conclusion. The final episode gives players a chance to see all the decisions they’ve made reach a climax that I didn’t expect. 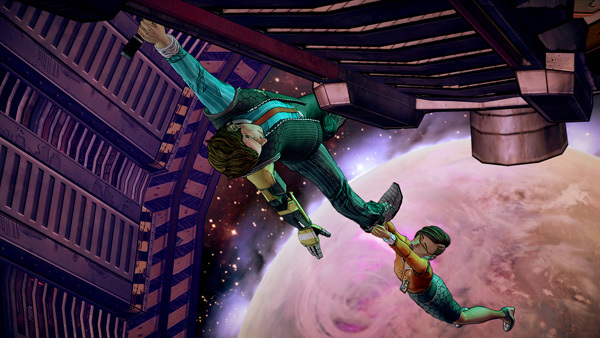 True to its roots, the setup for the final encounter involves selecting two teams of four made up of characters Rhys and Fiona have met along the way. This is where the episode delivers its biggest surprises, chief among them the notion that a character I saw die could have been saved. Conversely, it made me think “Aw, hell!” because it represented a missed opportunity that could only be rectified with an entirely new playthrough. With many character options available, there are opportunities for different interactions depending on who is added to the assault team. It’s not quite Mass Effect 2 though replaying the episode’s final chapter with different people is a fun way to capture the thoughts of the major characters. There are some great moments between them, especially during a Mighty Morphin’ Power Rangers homage. Now that the season is over, it’s time to ruminate on the product as a sum of its parts. I remember when the game was first announced and seriously doubted whether or not Telltale could craft a convincing story from a rather nihilistic shooter. Story in Borderlands 1 and 2 was mostly inconsequential and I believed crafting a decent plot across five episodes would be like drawing blood from a stone. Telltale managed to do it though not without a few missteps. At its best, the game nails the outlandish humor of the Borderlands series, painting Rhys and Fiona’s adventures on Pandora with the same violent and insane brush used for the original games. The characters are funny and charming as they play with narrative cliches and put a fun spin on the Unreliable Narrator. The game also has a great taste in music. Tales from the Borderlands was not without its slumps, however. The series’ middle episodes replaced the enjoyable madcap action and comedy with plodding exposition and character development. The fourth episode showed promise by bringing back much needed humor in a big way--a finger gun fight--that was equal parts absurd and epic. While I enjoyed the character interactions and reveals in “Vault of the Traveler,” I couldn’t get myself excited for the episode’s action packed finale. I had a difficult time connecting with the action because I kept thinking how fun the final battle could have been if it were a fully playable set piece instead of an extended quick time event. Additionally, the tech seemed to have a hard time keeping up with the action as screen tearing, character and asset glitching and pop-in proved themselves to be unflattering nuisances. Telltale did a fine job with Tales from the Borderlands and I cannot think of any other studio that could do what they do any better. It’s an interesting property to turn into an adventure game, especially when the source material is designed around loot and gaining experience. The series definitely has its high points, many of them in fact, and the production value in terms of its visual design and the impressive cast of voice actors are at the top of the list. Would Borderlands fans enjoy the series? Probably, though I could see them getting bored after awhile because what action there is gets relegated to analog stick gestures and button presses. Tales from the Borderlands isn’t a perfect story-based representation of the shooter franchise, though it is home to some really great characters and a few good laughs. Three episodes in and I’m already experiencing Tales from the Borderlands fatigue. It doesn’t help that I’ve been hooked with Life Is Strange, another episodic adventure that does well because it breaks away from the gameplay conventions Telltale has been using from the very beginning.